When you think about it, digital signage is nothing much more than a multimedia presentation displayed on a TV screen. 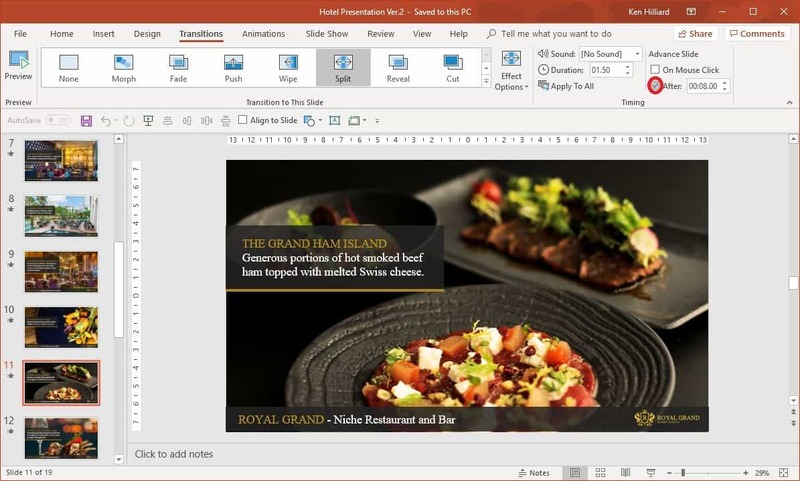 So why not create and display digital signage using PowerPoint®, a flexible, easy to use and full-featured content creation tool? This article will explore how to create and display digital signage using PowerPoint. To display digital signage using PowerPoint you need to satisfy two (2) basic requirements. First, you must setup your PowerPoint presentation so that runs in a continuous loop without any keyboard actions to advance the slides. Second, to display the PowerPoint digital signage presentation on a TV screen you need a Windows PC. 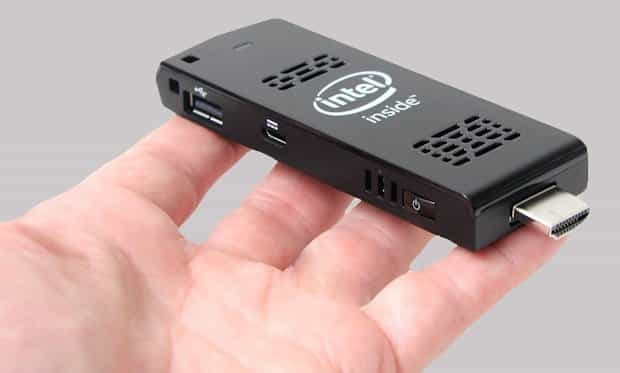 To meet the second requirement we will introduce PowerPlayer™, our low-cost Windows 10 mini-PC stick designed to display PowerPoint on any standard TV. PowerPlayer makes it easy to display PowerPoint presentations on your TV. And again, let’s not forget ease of use. 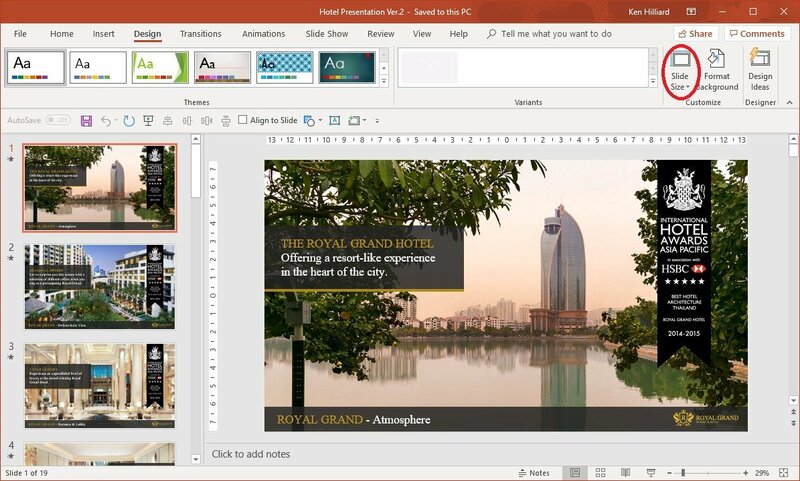 PowerPoint is also a software tool that most business people already own and know how to use. 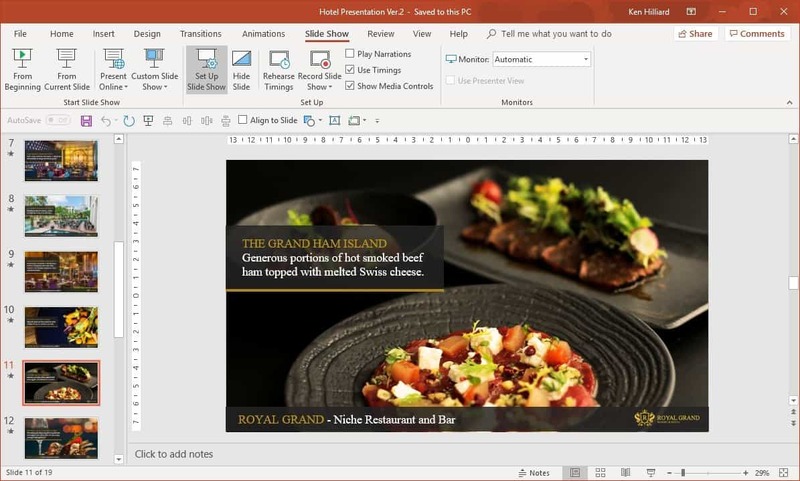 Microsoft® PowerPoint® is an ideal tool for creating digital signage content because of its ease of use, wide range of supported multi-media formats, animation features and the wealth of free and low-cost design templates. However, to use PowerPoint for digital signage there are two things you must do: make your presentation self-running—ensuring each page is displayed for a specified time—and to configure it to run in a continuous loop. Normally a PowerPoint presentation only advances, slide-to-slide, with a presenter clicking their keyboard or mouse. And, by default, when the presentation reaches the last page it will simply end—the presentation will not automatically loop back to the beginning and continue running. 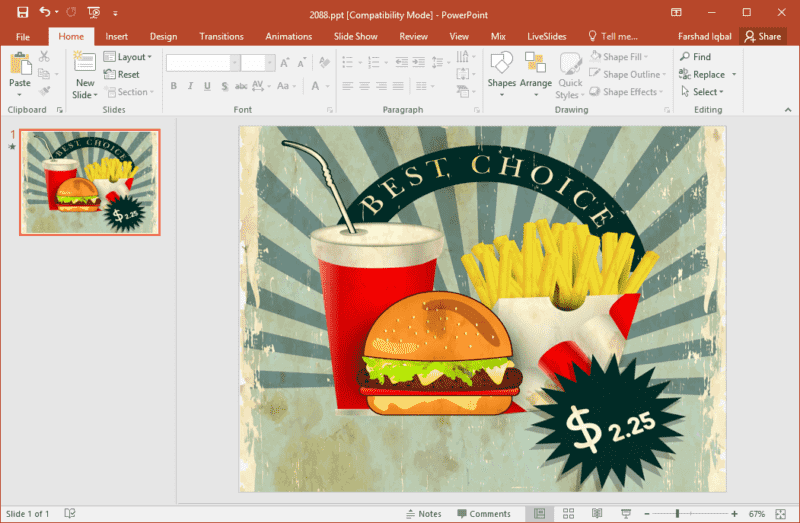 Open your presentation in PowerPoint. To make the presentation self-running click the TRANSITIONS tab on the main menu. On the far right of the TRANSITIONS sub-menu there is the Advance Slide section. For each page in your presentation uncheck On Mouse Click and check After in this section. Enter the number of seconds (or minutes) you want the particular slide to be displayed. If you want the same display time for all your slides click the Apply To All icon. In the example below (see Figure 1) the first page will be displayed for 8 seconds before moving to the next page in the presentation. By default, after the last slide is displayed PowerPoint will automatically end presentation. To be useful for digital signage the PowerPoint presentation must be configured to automatically loop back to the starting slide and continue. To continuously loop the presentation select kiosk mode. To setup kiosk mode select SLIDE SHOW tab from the PowerPoint main menu. From this sub-menu click the Set Up Slide Show icon. 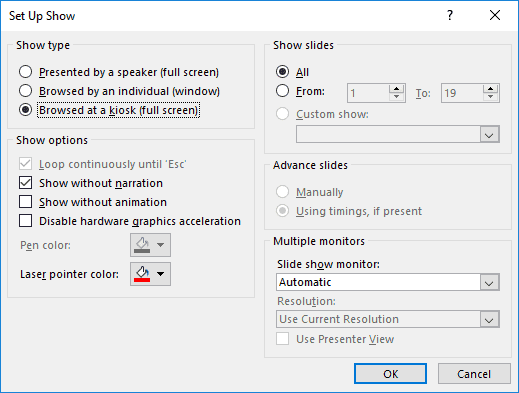 After clicking the Set Up Show icon the Set Up Show dialog box is displayed which is used to configure how your PowerPoint presentation will be displayed. Select Browsed at a kiosk (full screen) option and click OK. After this is done your PowerPoint presentation will automatically run at full screen and loop the presentation continuously. To specify portrait (vertical) orientation for your PowerPoint presentation select the DESIGN tab and click Slide Size. then select Custom Slide Size from the drop-down list. The Slide Size dialog box will be displayed. 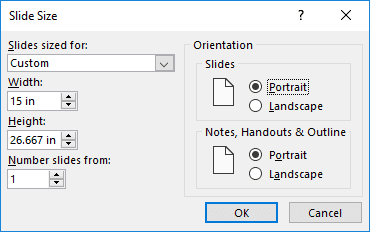 Select the Portrait option in the Orientation/Slides section in the dialog box and press OK.
As with PowerPoint, by default a Windows PC (for example, our PowerPlayer Windows 10 PC stick) will display all content on the TV screen in a landscape orientation. This is a display hardware configuration setting. If you wish to display your PowerPoint presentation in a portrait orientation, both the presentation and TV must be configured for portrait. We outlined how to setup a PowerPoint presentation for portrait in the previous section. 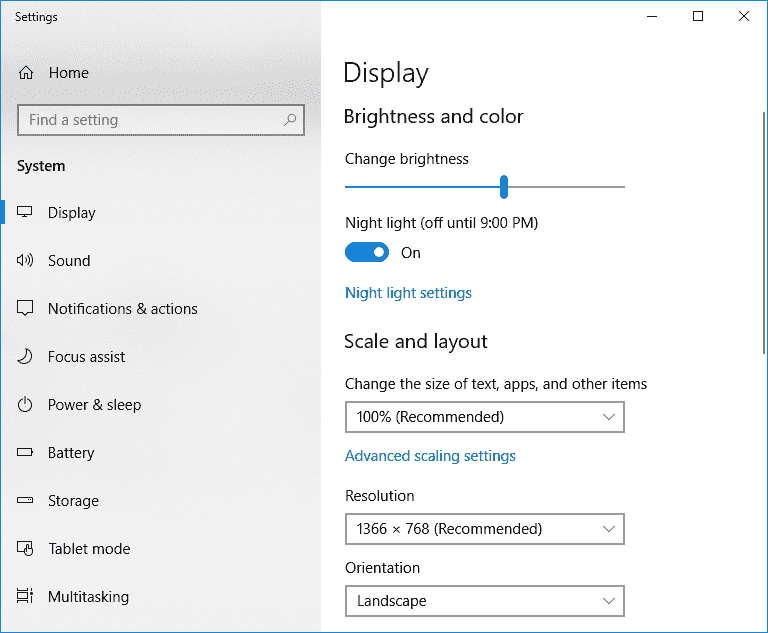 To change the TV display orientation to portrait on a Windows 10 PC simply right-click any blank area on the desktop and select Display settings from the context menu. The Display settings dialog box will be shown (see below). Select Portrait from the Orientation drop-down list. After confirming the orientation change your Windows PC will automatically display in portrait orientation whenever it boots and successfully logs in. It is possible that fonts used by your presentation will not be available on your PowerPoint TV player (e.g., PowerPlayer). In this case PowerPoint running on the TV player will use the “best available font”. To work around any font problems embed your fonts into the presentation file. When the digital signage presentation is shown the correct fonts will be displayed. To embed fonts into your presentation file select the FILE tab which will display the File menu. Click Options from the File menu command list. 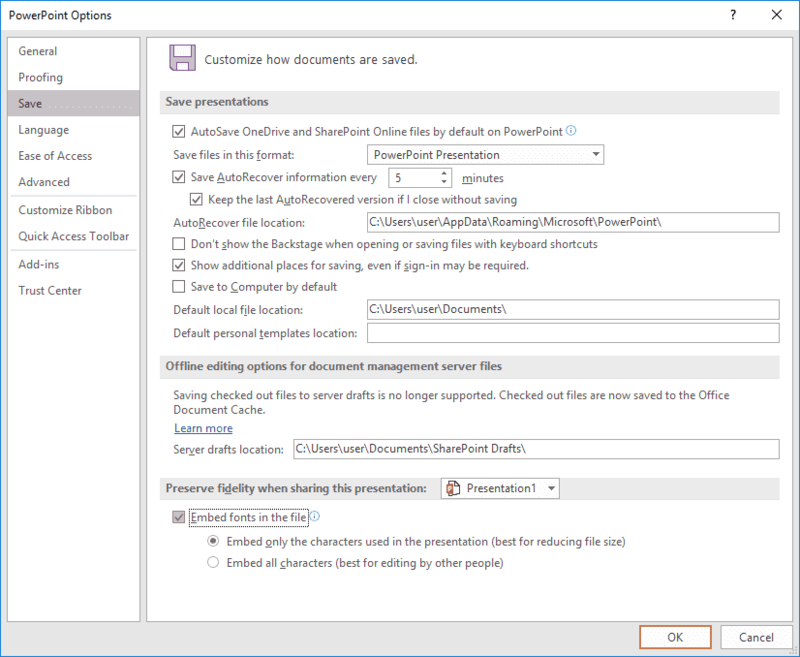 This will display the PowerPoint Options dialog box. Select Save from this menu. At the bottom of the Save menu check Embed fonts in the file and click OK.
Here’s an example of a hotel lobby digital signage presentation that was created using PowerPoint. To display digital signage using PowerPoint you need a Windows PC. But connecting a standard PC to a flatscreen TV display is both cumbersome and expensive. PowerPlayer is a low-cost Windows 10 mini-PC designed to display PowerPoint on any standard TV. It’s a pocket-sized digital signage player that plugs into that back of your flatscreen TV’s HDMI source input. The product package also includes PowerSignage™, our cloud-based content management service (CMS) which is used to upload, schedule and display PowerPoint signage presentations on your TV screens. PowerPlayer automatically downloads and displays PowerPoint digital signage presentations on your TV. 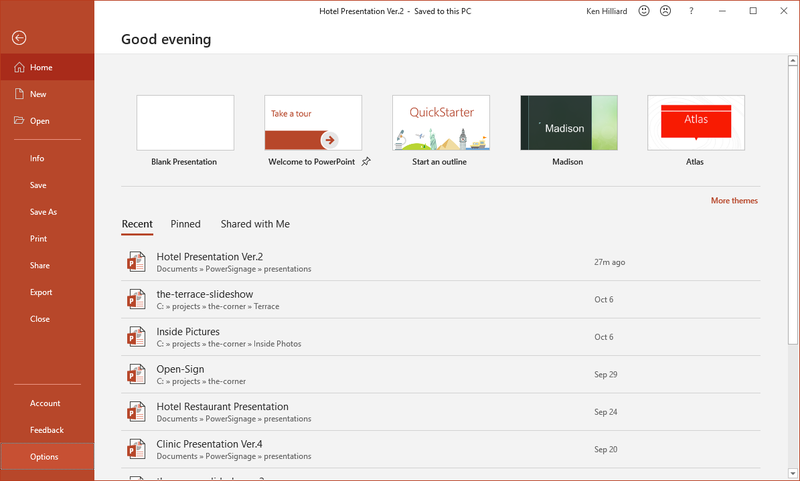 It’s PowerPoint plug-and-display ready. PowerPoint is an ideal tool for creating dynamic multimedia signage presentations. And PowerPlayer is a simple and cost-effective way to display digital signage using PowerPoint. We offer a complete PowerPoint digital signage solution, providing hardware, software and cloud service. For more information please take a look at our PowerPlayer product brochure or visit our website at www.powerdigitalsignage.com. Windows and PowerPoint are registered trademarks of Microsoft Corporation. PowerPlayer and PowerSignage are trademarks of Power Digital Signage.